This is a book / DVD coming out this month ? ! 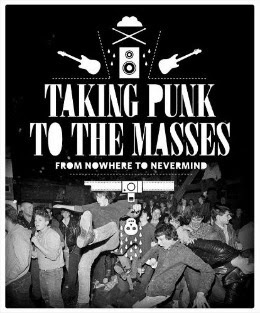 "Taking Punk to the Masses: From Nowhere to Nevermind visually documents the explosion of Grunge, the Seattle Sound, within the context of the underground punk subculture that was developing throughout the U.S. in the late 1970s and 1980s. This musical journey is represented entirely through the collection of Experience Music Project, Seattle’s museum of music and popular culture, pulling from a permanent archive of over 800 filmed oral history interviews and 140,000 artifacts – instruments, costumes, posters, records and other ephemera – dedicated to the pursuit of rock ’n’ roll. Featuring over 100 key artifacts from EMP’s collection, Taking Punk to the Masses illustrates the evolution of punk rock from underground subculture to mainstream embrace. These artifacts are put into context by the stories of those that lived it: Mudhoney’s Mark Arm, Devo’s Mark Mothersbaugh, Hüsker Dü’s Grant Hart, Beat Happening’s Calvin Johnson, X’s Exene Cervenka, Sub Pop founders Bruce Pavitt and Jonathan Poneman, Black Flag’s Henry Rollins, Screaming Trees’ Mark Lanegan, Blondie’s Chris Stein, Nirvana’s Krist Novoselic, Dinosaur Jr’s J Mascis, Soundgarden’s Kim Thayil, and nearly 100 others. Tracing a lineage from “Louie Louie” to the rise of Grunge with Nirvana, Soundgarden, Pearl Jam, Alice in Chains and Mudhoney, Taking Punk to the Masses is the first visual history of one of America’s most vibrant music scenes, as told by its participants and seen through the surviving artifacts." Read about the massive Nirvana exhibit happening at Experience Music Project in Seattle here.